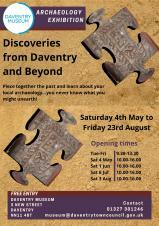 Archaeology Exhibition - Discoveries from Daventry and Beyond. Daventry's annual Motorcycle Festival returns to Daventry Town Centre on Saturday 8th June 2019, showcasing modern and classic motorcycles, plus live entertainment, street food, children's entertainment and more! Daventry Arts Festival returns to Daventry Town Centre from 21st - 23rd June 2019. There will be theater performances; live music; exhibitions and more! Full programme to be released nearer the time. If you would like to be involved in this year's Festival, please contact Amy Simpson via events@daventrytowncouncil.gov.uk. 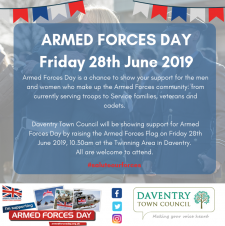 Daventry Town Council will be showing support for Armed Forces Day by raising the Armed Forces Flag on Friday 28th June 2019, 10.30am at the Twinning Area in Daventry.